Excited about Halloween? We sure are! 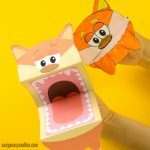 We designed 4 fun printable Halloween puppets, that will be a perfect DIY project for a Halloween party with the kids (either at home or in the classroom). 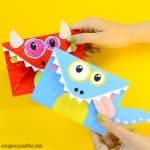 Let’s have some fun crafting these Halloween monsters! 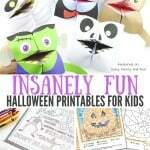 We are a bit crazy about Halloween crafts for kids, it’s a great time of the year to bring out all the ghouls! What better time of the year to make a bunch of witches, scary looking pumpkins, skeletons, vampires and other monsters. 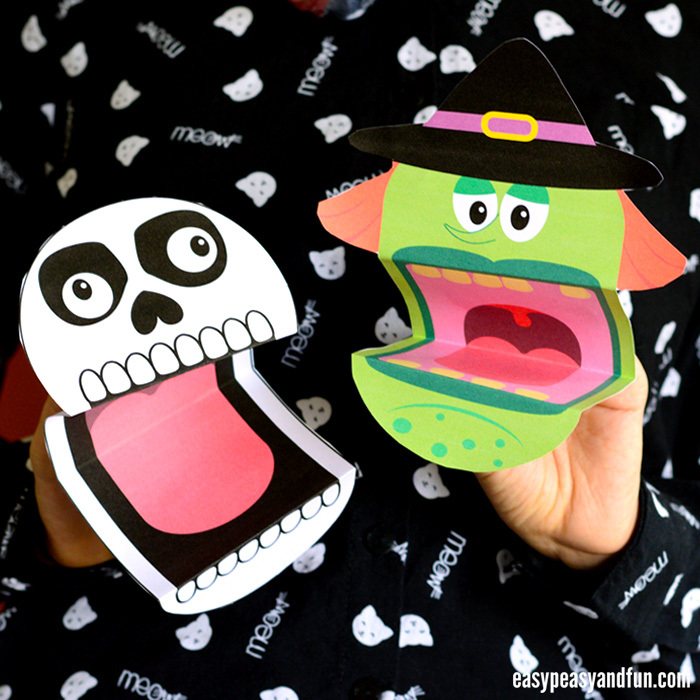 This set of printable Halloween puppets comes both in black and white version for kids to color in however they see fit and as a pre-colored puppets in case they just want to dive in and play. The wicked witch, looking all cool with her crocked teeth. And a chatty little skeleton. A bloodsucking vampire, just waiting to take a bite at something juicy. A Jack-o-Lantern that is ready to tell it’s tales of horrors. 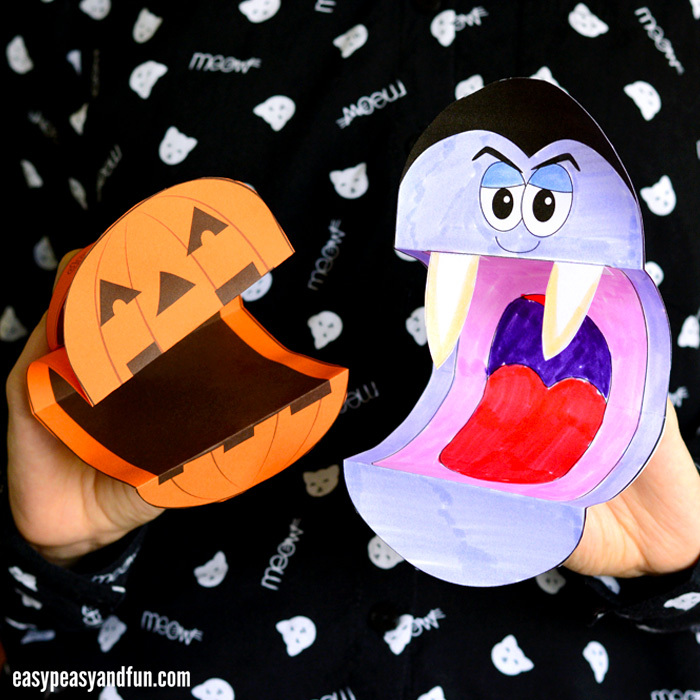 You can grab all of these Halloween printables at the end of this tutorial. Print out our template. You can print them on regular print paper although heavier print paper is recommended. 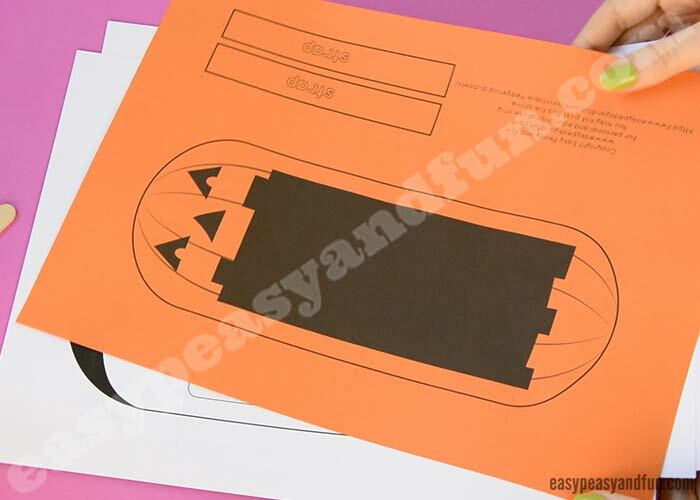 You can print on regular white paper or use colored paper where it works – like orange paper for the Jack-o-Lantern printable Halloween puppet. If you printed our black and white printable templates to color in, now is the best time to do it. We love coloring with markers! 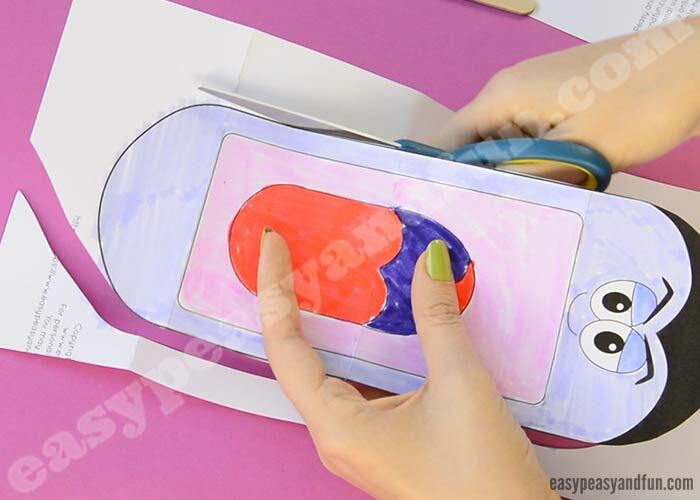 Once you have colored your puppet, it’s almost time to cut it out. First make a cut to separate it from the strips, don’t jet trim it. You’ll notice there are markings next to the puppet, showing you where you need to make the folds. Make the folds along those dashed lines. To make the folds really crisp, run your finger or a craft stick over the folds. Now cut out the puppet. And strips and teeth if you are making a vampire. 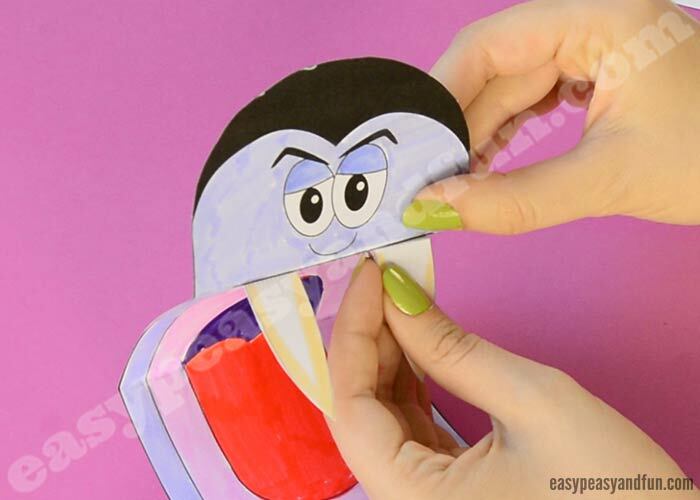 If making a vampire, you’ll have to stick the teeth into it’s mouth. 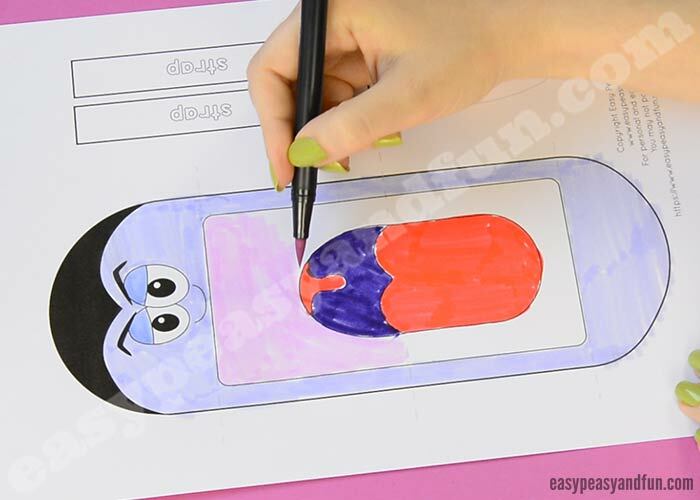 Fold along the dashed line on the teeth and apply glue on the area with the word glue on it. Glue them (arched) on the puppet. Your Halloween puppet is ready to be played with. Thanks for sharing this! My granddaughter Alice is excited to do this with me. This is a great activity for my second grade class!!! 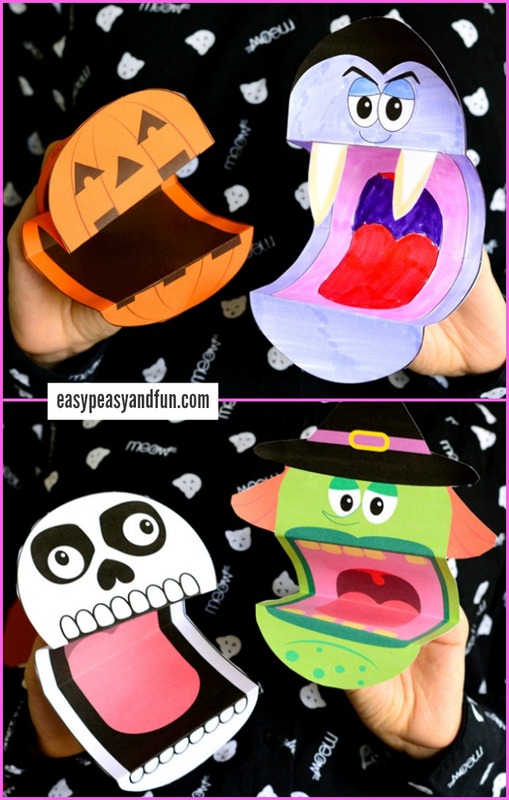 I love the Halloween Puppets ! Easy and fun! My grandchildren will have a blast making these. 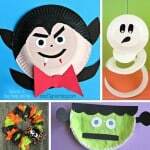 Can’t wait to use for a craft at my son’s Halloween party! thank you! we love it!! Fantastic. Can’t wait to use them! my girls will love this ! it’s so cute. 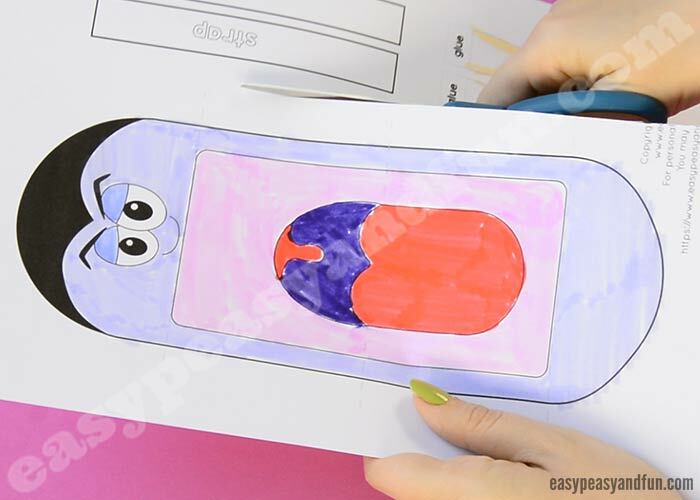 I’ll help my kids to do this craft. Thank you for sharing! My little learners will enjoy this activity. Thanks for sharing this! My second grade class are excited to do this with me. Nice! Kids will have lots of fun! These look so fun and finally something easy and different! Arogato for sharing these templates! These look like fun. I can’t wait to try them with my preschoolers. My PreK class will love these! 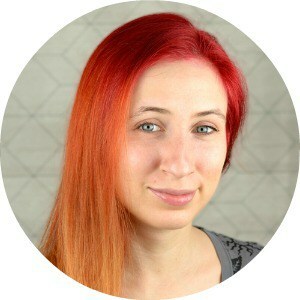 Thank you, Andreja! 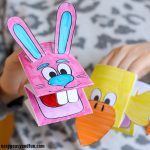 I love the fun craft ideas, and I appreciate that you shared the templates! I can’t wait to try these with the kids. My students are super excited to do this craft! Looking forward to trying these. Thanks! Thank you so much for this free craft. Absolutely brilliant! Such a simple idea but so clever. My son has enjoyed making all of the designs! I’ve also used them for my students and they loved them too. These look like fun! Can’t wait making them!